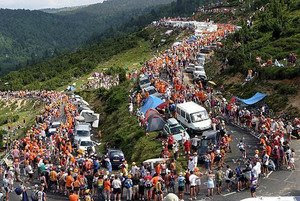 In July the Tour de France will bring hundreds of thousands of cycling fans to this area. Local merchants will be happy, the sponsors will be delighted, politicians, if all the planning has gone well, will congratulate themselves, and philosophers, well, they will do what philosophers always do, wonder “why?” What is it that makes people travel thousands of miles to see a sporting event? In one way the answer is simple: we are drawn to situations where individuals challenge limits. Gravity is a force that weighs us down: gymnasts defy it. Science says it should not really be possible for a batter to hit a baseball: Ted Williams managed to do it 40% of the time. Who could possibly race downfield, turn at the last moment, reach up and catch a ball knowing, with absolute certainty, that a major pummeling will immediately ensue: it happens every Sunday in the NFL. Beholding in wonder as our cousins from the human family stretch limits gives us a glimpse of the greatness to which humanity can aspire. But that explanation is not enough. It would have worked for the Greek Olympic games or for games in various Roman arenas like the one in nearby Nimes pictured below. Today, though, we have television. If what counts is getting the best view, then television is the way to go. Why then do we keep up the expense and the effort to attend sporting events in person? In part it is because presence “in person” means something. We are embodied creatures and physical presence is just something that is significant for us. Tangibility is not negligible, even if spectatorial precision is sacrificed. The model, haptic, activity is the human hug, an expressive gesture for which there is no substitute in times of joy, triumph, sorrow, or celebration. Beyond the physical aspect, there is also what the philosopher Charles Taylor calls the “festive” side of human life. We are social creatures. Sharing in important events is something we long for. The festive dimension emerges at birthday parties, weddings, Fourth of July picnics, Mardi Gras, and sporting events. 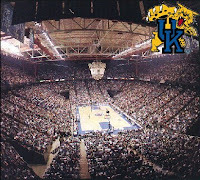 I was once in Lexington Kentucky the day of a UK/LSU basketball game. “Festive” was definitely the word. Thousands of fans dressed in team colors; plenty of food and libations outside Rupp arena. All in all, an opportunity for currents of enthusiasm to move electricity- like through the crowds. Finally, there is another crucial dimension. The presence of an audience is not incidental to a sporting event. It is an essential component. A sporting event without an audience is like a play without an audience. Without the audience, the episode is incomplete and thus something other than a full-fledged sporting event. The word “spectator” is somewhat misleading here. “Spectator,” as mere onlooker, offers a good description of the TV viewer. It is a mistake to label, as we do, attendees at either the theatre or the stadium, as “spectators.” It was not always so. Historically, for the theater and Western culture in general, the moment of transition from audience to spectator can be dated to the stage design which made prominent the proscenium arch. BP, “before proscenium,” the stage actually jutted out into the audience. Not being sharply separated from the actors, the audience members known as “gentlemen in the pit” had a particularly strong reputation for their, let’s call it “dynamism.” Now AP, “after proscenium,” after the picture frame approach to theatre, audiences tend to be passive spectators. In sports, the active, energetic, enthusiastic fan is still the rule. A sporting contest without an audience may be an occurrence or a happening, but it is not yet a sporting event in the fullest sense. The audience is necessary, not optional. To call the participant-fans “spectators” thus diminishes their significance. A sporting fan both is moved by and is a mover of the action. Together, fans and athletes make the event what it is. That way, in-person attendees become more participants than spectators. Without them there is no real event. No wonder they displace themselves willingly. I enjoy your delightful writing style. Maybe I have a bit of the philosopher in me as I frequently ask why? I long ago decided that football was a socially sanctioned substitute for war and therefore became tolerable to me. On the subject of the audience being a key player in the event, wouldn't it be delightful if God could be cheered and the Devil booed in church. That would really raise the roof!! !L.